The alternative health movement has been gaining quite a lot of momentum in recent years. And it’s quite evident from the number of people who are seeking different forms of natural thyroid treatment instead of relying on the conventional medical community which has had quite the bad track record with hypothyroidism. But not every natural treatment for hypothyroidism is right everyone. In fact, there are some that are flat out wrong but are still promoted, mostly because of financial interests. Below, I cover two of the most commonly used supplements as treatment for hypothyroidism and why they aren’t right for everyone. I also discuss a little bit of why the right diet for hypothyroidism should be incorporated as a major component of any natural thyroid treatment. If you do just a little bit of research about hypothyroidism, you’ll be inundated with all different kinds of iodine supplements that are being highly touted as the best natural thyroid treatment available. Iodine is an element that is required by your thyroid gland to secrete thyroid hormones. Before industrial times, the incidence of goiters was much higher and oftentimes attributed to iodine deficiency. If you didn’t get enough iodine in your diet then those thyroid hormones would build up within the thyroid gland causing it swell. But that was before industrial times. Today, goiters are caused primarily by excessive estrogen and iodine deficiency is very rare. But that isn’t stopping people from endorsing or using iodine as a natural thyroid treatment, but at what cost? It makes sense as to why it’s so highly promoted today. It’s very inexpensive to manufacture. It’s one of the only hypothyroidism treatment options that doesn’t require a medical prescription. So overall, it’s great for profits. 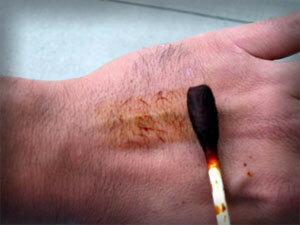 But you have to keep in mind that the daily requirement of iodine is very small (150 mcg is usually safe). And most of these supplements are pumping you full of relatively large quantities of iodine which can actually have a negative effect on both your thyroid and your health. Excessive iodine can suppress TSH levels and give you the appearance that your thyroid function has improved. But in reality, it oftentimes leads to thyroiditis and further suppresses your thyroid. And keep in mind that there are other hypothyroidism causes that don’t directly involve your thyroid gland. For example, if your liver is the cause of your hypothyroidism then using iodine to try to stimulate your thyroid to produce more thyroid hormones becomes a very counter-productive natural thyroid treatment. In this case, T4 would continue to accumulate in your liver which would even further suppress your thyroid, making matters worse. So keep this in mind because iodine most likely not going to get you the natural thyroid treatment results that you are looking for. And in excess, it can even exacerbate your existing hypothyroidism symptoms. 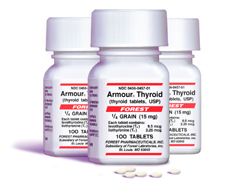 Desiccated thyroid medication such as Armour Thyroid is one of the most heralded natural thyroid treatment options available. It’s typically extracted from the thyroid of either pigs or cows and has the benefit of the hormones being formulated in proportions that more closely resemble that of your thyroid gland. Desiccated thyroid medication is not widely recommended within the conventional medical community even though desiccated thyroid has been shown to provide far better results as a natural thyroid treatment. Instead, primarily due to the financial interests of the pharmaceutical industry, they continue to push the T4 only medications with very poor results. Unfortunately, your money is more important than your health to many people. But there are still many cases of Armour Thyroid side effects where desiccated thyroid is not the best natural thyroid treatment option. And more often than not it involves the influence of other hormones as well as liver issues that can make any additional T4 a problem. In these cases, it can be far more beneficial to supplement with T3 only. Most people have no idea that diets today are drastically different than they used to be even a century ago. Before the time of fast food and restaurants on every street corner, most families cooked and even raised the majority of the food that they ate. Some refer to this as more of a traditional diet but at that time, there weren’t too many options. And during those times, there wasn’t as big of a prevalence of hypothyroidism as there is today and that’s because people were getting their own natural thyroid treatment without even knowing it, through their diet. Today, when you think of natural thyroid treatment, you automatically think of supplements and pills like the ones mentioned above. You would never stop to think that the foods that you eat would have a drastic effect on your thyroid. We used to consume the entire animal in some way or another. For example, we use to make stock from the organs and bones. Today, we eat the meat off the bone and wrongly believe that the meat is where all of the nutrients are. But nothing could be further from the truth. We use to get a significant amount of hormones and nutrients from these parts of animals that we so easily discard today as garbage. And because of this, we are feeling the effects by suffering from hormonal imbalances and nutrient deficiencies. Keep in mind that this is just one example of many, where the standard diet today is contributing to hypothyroidism and where the right hypothyroidism diet could make all of the difference with how you feel. So, without a doubt, one the best natural thyroid treatment options that you have at your disposal is to eat a diet that does support your thyroid instead of one that suppresses it. And then you can incorporate some sort of thyroid medication to help give you that last little boost that you need in order to keep your thyroid operating at its best. This entry was posted in Thyroid article, Thyroid Ebook and tagged Natural Thyroid Treatment, thyroid.